Two days ago, I was interviewed on Finnish television. The program was Min morgon (”My morning”), which is broadcasted in Swedish with Finnish subtitles. I had been asked to select one image from the Rites of Life project which showed a ritual that had made a strong impression on me. I am often asked which ritual is my favourite or has made the strongest impression on me, and it is always very hard to choose. So many things made a strong impression while working on this project. Anyway, I chose a picture from a reburial ceremony, a unique death ritual performed in the highlands of Madagascar. 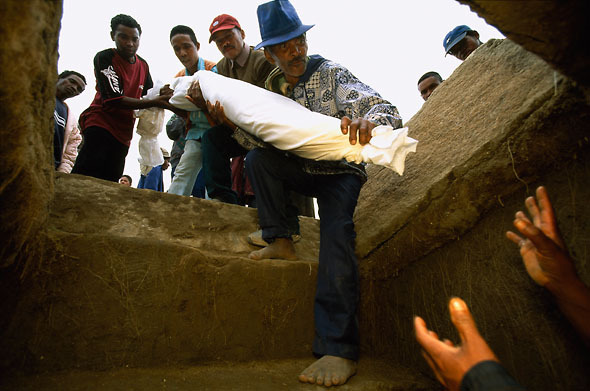 In this part of Madagascar the dead are buried in family graves. Sometimes, when the family has gathered enough resources in terms of food and money, they hold a reburial ceremony, during which they open the grave and bring out the most recently buried. They dead are wrapped in new shrouds, given liquor, told stories of what has happened since last time and then hoisted onto the shoulders of the descendants who dance with them several times around the family grave before returning them to their resting places beneath the ground. The reason behind this ritual, which may seem macabre at first glance but which is truly an act of love, is that it is important to attend to and thereby be blessed by ones ancestors without whose support nothing can go well in life.